When it comes to cultured dairy, milk kefir is one of my favorite. I even like it better than yogurt. It’s tangy and fizzy…and well, just downright delicious. And thanks to that fizz, it has been coined the champagne of milk!! So not only does it tickle your tongue, it tickles your belly too…it’s teaming with probiotics for good gut health. And the best thing about milk kefir? It’s easy to make. Unlike yogurt, when it comes to making milk kefir, you do not need to heat the milk. Put the kefir grains in a jar (about a tablespoons worth), pour milk over them, put a lid on the jar, and place the jar in a warm spot on your counter. Leave the jar undisturbed for about 12 hours…and voila! Milk kefir. It couldn’t be easier. Strain out the grains from the jar in which you have cultured the milk kefir and enjoy. You can certainly drink it room temperature but I like it best after it has been refrigerated for a bit. And what do you do next with the kefir grains? Put them back in the jar, pour milk over them, and start the process all over again. But where do I get the kefir grains? Sourcing kefir grains is easy. You may have a friend who has some extra and will share a few with you. (They multiply quite quickly!) If your neighbor doesn’t have any available, you can buy them online. 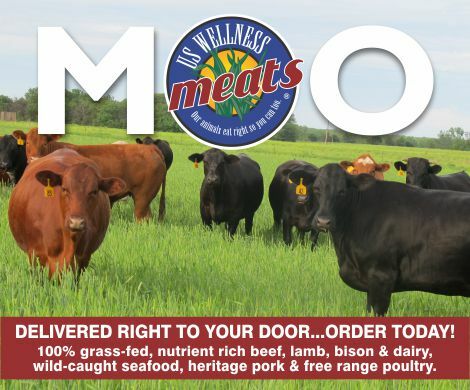 Cultures for Health sells them in a dehydrated form. When they arrive, you just need to rehydrate them, which takes a day or two and then you can start making kefir. 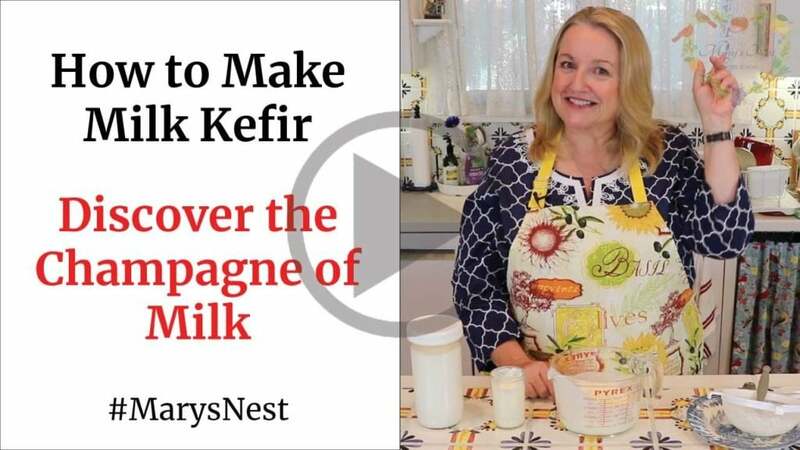 Be sure to watch the YouTube video as I walk you through the step-by-step process of making milk kefir. Milk kefir is a form of cultured dairy similar to yogurt but with one major difference. You do not need to heat the milk. This makes milk kefir an easy beverage to make. But not only is it easy to make - it's also delicious. It's fizzy and tangy...it's the champagne of milk! Combine the milk and the grains in a jar and stir gently. 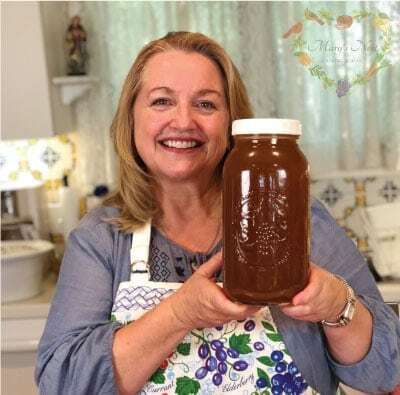 Place a lid on the jar and tighten it gently. Place the jar in a warm place where it can rest, undisturbed, for approximately 12 hours. After 12 hours, place a small strainer over a new container in which you will store the milk kefir. Strain the milk kefir into this container, using the strainer to catch the grains. You can now drink the milk kefir or refrigerate it to enjoy it cold. Transfer the kefir grains back into the original jar, add fresh milk, stir, replace the cap, and place the jar in a warm spot where the jar can be undisturbed for 12 hours while the milk cultures into another batch of milk kefir. You can repeat this process indefinitely, making milk kefir every day. If you wish to cease making milk kefir, you can store your grains covered with milk in a jar for a few days in your refrigerator. If you want to store your grains longer than a few days, you can store them covered with filtered water in jar in your refrigerator. This will allow the grains to "go to sleep". When you are ready to make milk kefir again, you can "wake up" your grains by following the instructions for making milk kefir. The first few batches of milk kefir will be watery, but after a few days, your grains should begin to culture the milk into a thicker milk kefir.